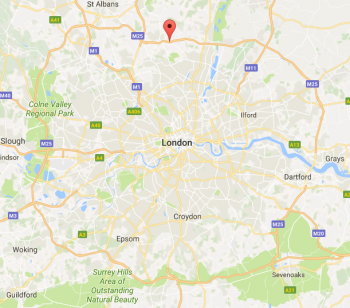 We can attend emergencies across London in 30 Minutes.All Vans are fully stocked with boards,locks and glass.This enables us to carry instant repairs on site to make any premises secure. As locksmiths/glaziers/carpenters we operate a complete boarding up service in London.We secure properties 24hrs a day.If you need emergency boarding up,temporary doors or locks we can help. We specialise in commercial boarding up and fit temporary doors to allow trading to continue.We also have a residential boarding up service 24hrs a day across London. Whatever reason you need a board up in London we are here to help.We specialise in boarding up properties and making them secure.Whether you need windows boarded or doors boarded.We can attend within thirty minutes to board up your property.We attend all residential boarding up and commercial boarding up in London. As Locksmiths & Glaziers we carry out these repairs 24hrs a day. As a boarding up company in London we secure all shopfronts and windows making them secure with our emergency boarding up service in London.We use a clamping systems to secure the boards which prevents any further damage. 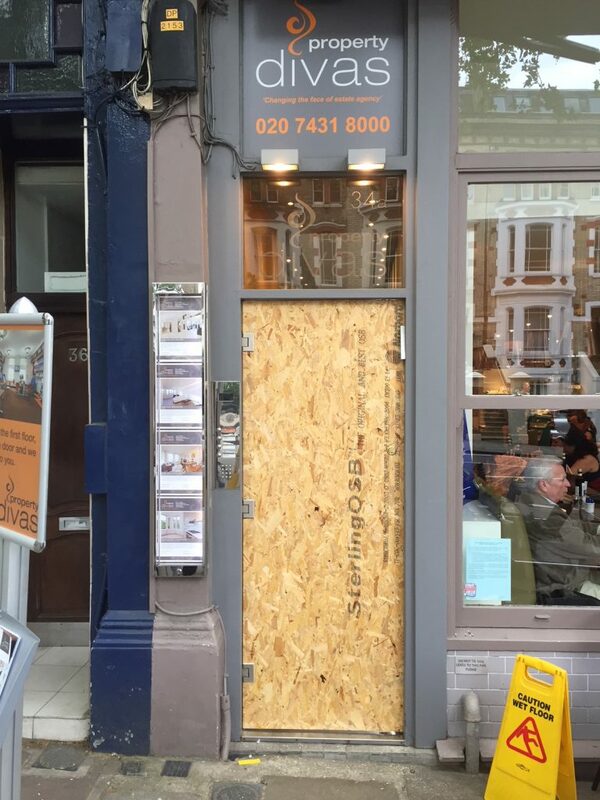 We specialise in shopfront boarding up across London.With a rapid response time of thirty minutes.As locksmiths & glaziers we are able to board up shopfronts and add extra security if needed. We can fit temporary doors to enable you to carry on trading whilst new glass or doors are being manufactured.We replace all doors and repair them where possible.Please take a look at our door repair services in the menu above. 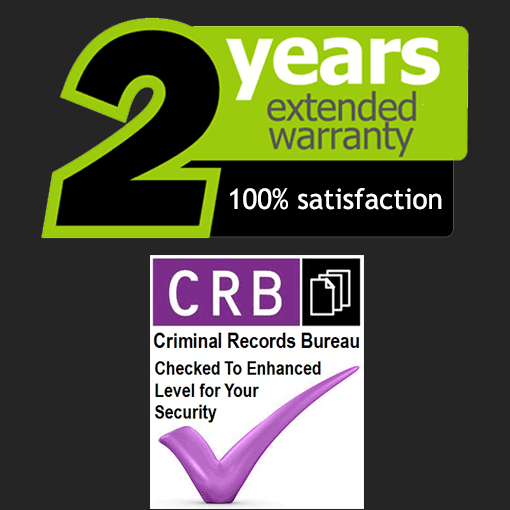 We are experts in window boarding up in London.We leave windows boarded and properties secure,with no damage to the window frames.We use a clamping system which is perfect for boarding windows.Combined with plywood or sheet metal this leaves the window secure and avoids more damage being caused. 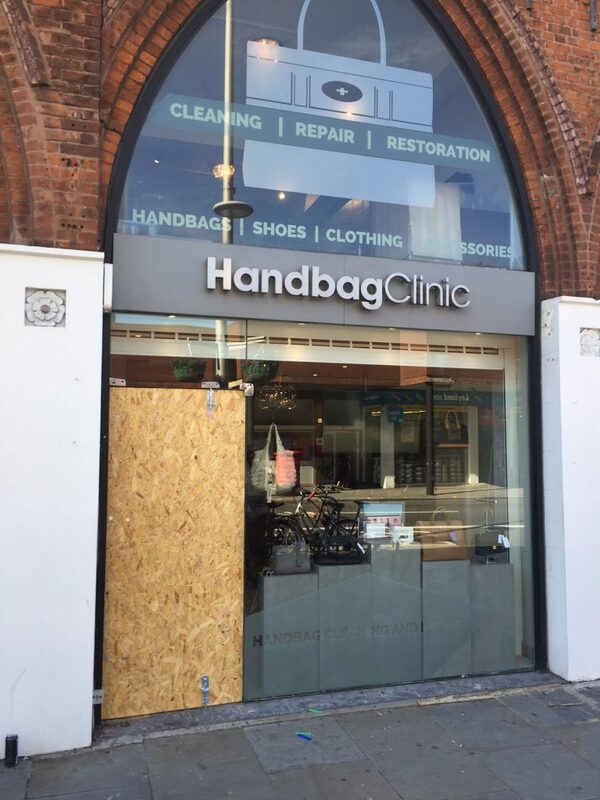 We also use a special security film which prevents injury from falling glass.This can also be used when a board up is not suitable.Some retail shops and business do not want to give the impression of being closed.The security film is clear while making the broken glass safe,it does not impact on the light entering the premises. 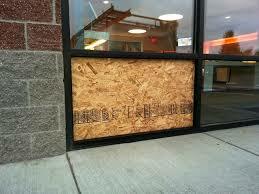 Door boarding up is one of our most used services.Whether its after an attempted break-in or a delivery gone wrong ! We provide a fast service to enable you to carry on trading.We often cut and fit glass on site but many doors these days are fitted with double glazed units.This means boarding up the door is the only option as DG units are made to measure and take a few days to process. When boarding doors we use a clamping system which is very secure and also does not damage the door or frame.In certain circumstances we use a clear security film which prevents further damage or injury. We have an emergency door boarding up service and can be with you in thirty minutes across London.We fit temporary doors too if required.